April 18, 2019 Tweet - "We believe the only way to begin restoring public trust in the handling of the Special Counsel's investigation is for Special Counsel Mueller himself to provide public testimony in the House and Senate as soon as possible. The American people deserve to hear the truth." April 18, 2019 Tweet - "Now that President @realDonaldTrump's campaign press conference is over: It's time for Congress and the American public to see the #MuellerReport." April 18, 2019 Tweet - "AG Barr's handling of the #MuellerReport has been regrettably partisan, including his slanted 3/24 summary letter, irresponsible testimony before Congress, & indefensible plan to spin the report in a press conference today--hours before he allows the public or Congress to see it." April 18, 2019 Tweet - "What we've learned today is that Attorney General Barr deliberately distorted significant portions of Special Counsel Mueller's report. #MuellerReport My statement with @SpeakerPelosi:"
April 18, 2019 Tweet - "The differences are stark between what Attorney General Barr said on obstruction and what Special Counsel Mueller said on obstruction." April 17, 2019 Tweet - "The American people deserve the truth. They don't need any more pre-damage control or spin from @realDonaldTrump's hand-picked attorney general, William Barr. Mr. Barr is acting more like a Trump campaign spokesman than an independent agent of the law." April 17, 2019 Tweet - "The process is poisoned before the report is even released. Barr shouldn't be spinning the report at all, but it's doubly outrageous he's doing it before America is given a chance to read it. Barr doesn't want Americans to make up their own mind. What is he so afraid of?" April 16, 2019 Tweet - "The Saudi-led war in Yemen is inhumane. So is President @realDonaldTrump's veto. Why won't he hold Saudi Arabia accountable for its role in the devastation and humanitarian disaster?" April 15, 2019 Tweet - "We all know @realDonaldTrump took all aid for Puerto Rico but nutrition assistance out of the bill. The bill has none of the long-term recovery & resilience aid PR has asked for repeatedly. Stop the bull. Stand up to the President. Help all communities rebuilding from disaster." 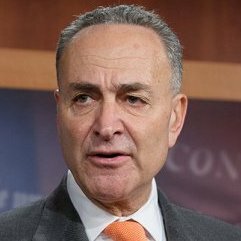 April 15, 2019 Schumer Reveals: Nuke Waste Continues to Sit Smack in The Middle of Niagara County--despite Fed Promise 4 Years Ago to Clean It Up; Senator Launches Major Push to Secure +$250 M Increase to Vital Cleanup Program for Niagara Site so Army Corps & Energy Dept. Can--once and For All--clean. Up. The. Mess. April 15, 2019 Tweet - "Notre Dame towers over the Parisian skyline physically, culturally, and symbolically. There are no words that can describe the sense of loss humanity feels today." April 15, 2019 Tweet - "President @realDonaldTrump sold the Republican tax bill promising a "middle-class miracle." But today on #TaxDay, millions fewer Americans are set to receive tax refunds. And 30 million taxpayers could owe the IRS money because of the new tax law. #GOPTaxScam"
April 14, 2019 Tweet - "How can you say you're Puerto Rico's voice in the Senate while supporting a disaster bill that strips needed help from the island and is opposed by PR's Governor? Why not stand up for both PR & Florida, and have the courage to tell @realDonaldTrump to leave no community behind?" April 12, 2019 Tweet - "President @realDonaldTrump's #TransMilitaryBan that goes into effect today breaks the faith with those serving and those who aspire to serve. Whether trans or otherwise, if you're qualified you should be permitted to serve." April 11, 2019 Tweet - "Whether it's defending the administration's dangerous health care lawsuit or perpetuating conspiracy theories, Mr. Barr is acting more like the president's campaign spokesman than the independent attorney general he's supposed to be." April 11, 2019 Tweet - "Why are @SenateMajLdr McConnell & @SenateGOP about to recess the Senate without passing disaster relief funding? Americans come together when disaster strikes, but now Senate Republicans are turning their backs on Americans who need our help to rebuild after natural disasters." April 11, 2019 Tweet - "Now that Julian Assange has been arrested, I hope he will soon be held to account for his meddling in our elections on behalf of Putin and the Russian government." April 11, 2019 Tweet - "The way these abrupt closures and sudden firings went down was anything but friendly. Workers deserve advanced notification when they are terminated en masse. That did NOT happen with Friendly's." April 11, 2019 Tweet - "I was pleased to meet with Gary Bodeau, Speaker of the House of Deputies in Haiti, and Hervé H. Denis, the Haitian Ambassador to the United States. We must extend Temporary Protected Status (TPS) to make sure that vulnerable Haitians here legally can stay in America." April 10, 2019 Tweet - "With the support of 33 Republicans, the House passed the Violence Against Women Act reauthorization including provisions for gun safety and tribal issues. If the @SenateGOP cares about protecting victims, they must demand @SenateMajLdr McConnell let us vote on #VAWA now." April 10, 2019 Tweet - "Every time President @realDonaldTrump faces a new challenge, he just keeps pointing his finger to blame others. Blame her, blame him. Fire this one, fire that one. President Trump: It's time to fix the chaos in your administration." April 10, 2019 Tweet - "Mr Bernhardt's an oil & gas lobbyist who made a career harming the environment & helping polluters sidestep regulation As @realDonaldTrump's pick to lead @Interior, it's hard to imagine someone whose background is more at odds with protecting public lands"
April 10, 2019 Tweet - "AG Barr admitted he had no evidence to support his claim that spying on the Trump campaign "did occur." AG Barr must retract his statement immediately or produce specific evidence to back it up. Perpetuating conspiracy theories is beneath the office of the Attorney General." April 10, 2019 Tweet - "As the American people experience the consequences of the FCC's misguided #NetNeutrality decision, they'll know it's because @SenateMajLdr McConnell & Senate Republicans refused to stand up to special interests and take action to stop it when they had the chance #SaveTheInternet"
April 10, 2019 Tweet - "Republicans' healthcare plan is simple: All repeal, no plan to replace. Again and again, President @realDonaldTrump's administration and Republicans in Congress have worked to take away American families' health care and raise their costs." April 9, 2019 Tweet - "When American citizens in one part of the country are in trouble because of a disaster, we come together and help them ALL. Not just the ones President @realDonaldTrump likes or finds politically advantageous. We help them ALL." April 9, 2019 Tweet - "President @realDonaldTrump and our Republican friends believe they know better than American women. That's wrong, and American women know it." April 9, 2019 Tweet - "I hope that President @realDonaldTrump or some of the people around him will realize that his administration is far from a "fine-tuned machine." It's a slow-motion disaster machine that the American people see in action every day." April 8, 2019 Tweet - "This impasse over disaster relief funding would go away in an instant if only Republicans would do one thing: Stand up to President @realDonaldTrump to make sure every community across America affected by natural disasters gets the funding they deserve." April 8, 2019 Tweet - "The outgoing Secret Service director Randolph "Tex" Alles must testify before Congress as soon as possible about the potential security vulnerabilities at Mar-a-Lago involving a Chinese national arrested with malware, and other counterintelligence and national security threats." April 7, 2019 Tweet - "When even the most radical voices in the administration aren't radical enough for President Trump, you know he's completely lost touch with the American people." April 6, 2019 Tweet - "A WWII veteran. A governor in South Carolina who helped shepherd peaceful desegregation. A senator from South Carolina who championed the fight against hunger. Fritz Hollings spent his life serving his state and his country. South Carolina has lost a giant today." April 5, 2019 Tweet - "For the THIRD time, the courts have ruled against @realDonaldTrump's attempt to undermine the #2020census. The census must be protected. And everyone must be counted."